Are You Ready for Magic Music? After forty-something years the greatest Vineyard band you never heard of is releasing a debut album. Once again, Will Luckey refused to sign the record deal because he thought they were going to get ripped off. "He was wearing pointy shoes," he recalled. "You couldn't trust a guy like that." This was going to be a breakout night for Magic Music. It was the early 1970s and the band, which had Vineyard roots, was living in some old school buses up in the Colorado mountains. They had a passionate local following, but tonight they were opening for Cat Stevens, one of the biggest acts of the moment. It was to be the first stop on a national tour, so the band, wives, girlfriends, friends, and five dogs all packed into the buses and the hippie caravan left Eldorado Canyon for a Denver auditorium. There was a good crowd at the arena, maybe 3,000 people. James Taylor and Joni Mitchell were backstage and, honestly, it was a bit daunting. Up until then, a big night for Magic Music was Saturday night at Tulagi’s Bar in Boulder. But the band was up to the task and when they stepped out onto the stage, they owned it. After an inspired set, the crowd wouldn’t let them leave. One encore, two encores, three encores – they could have played all night. So who were these guys anyway? 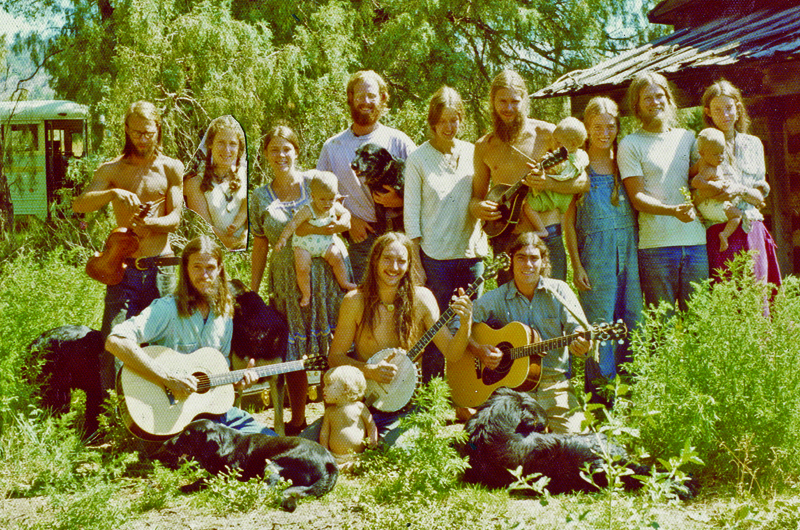 Back to the Garden: Members of the band, friends, lovers, babies, dogs, one of the buses, and someone who was somewhere else at the time. Back in the sixties, a couple of high school kids, Luckey and Tim Goodman, met on the Vineyard, where Luckey had attended grade school and Goodman’s family had summered for generations. The two quickly bonded over their love of playing music and eventually joined up with Bill “Das” Makepeace and Daniels to form a band called Lefty’s Bench. There was a vibrant music scene on the Island back then – James Taylor, Carly Simon, and Tom Rush were just starting out – and Lefty’s Bench played at places like the Moon-Cusser Coffee House in Oak Bluffs, the Chilmark Community Center, and Grace Church. In 1971, however, Luckey headed out to Colorado. After a brief stint at Colorado College, he made his way to Boulder, and started busking on the campus of the University of Colorado. 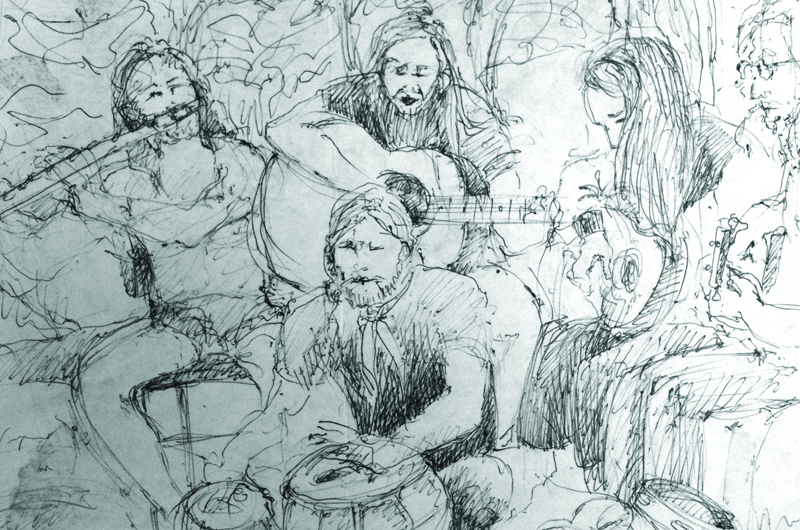 There he met a couple of fellow panhandlers, a gifted guitar player named Lynn “Flatbush” Poyer and an ethereal flute player named George “Tode” Cahill. They added bass player Rob “Puna” Galloway to the group, called themselves Magic Music, and moved up to Eldorado Canyon, a half hour out of town. Not everyone saw it quite that way. When Luckey told his father that he could “do this forever” because he could go down to the CU campus and make $120 whenever he wanted, the retired three-star Marine general was singularly unimpressed. Around 1972 band members Galloway and Poyer decided to seek their fortunes elsewhere and were replaced by Daniels and Bill Makepeace, former bandmates from Lefty’s Bench on the Vineyard. Daniels, in particular, was a prolific songwriter and infused new life into the band. By that time the band and their entourage had moved even farther up into the mountains (this would be a recurrent theme) to Allenspark, about an hour and a half out of Boulder. Magic Music had a regular gig at a little local restaurant called the Hummingbird Café where they’d literally play for their dinner, and people would trek up from the city to hear them. Two of their biggest local fans in Allenspark were an older couple known as The Wizard and Chainsaw Margaret. The Wizard, a Merlin-haired man whose real name was Otto Walters, was the local postmaster, while Margaret acquired her nickname because of her penchant for felling billboards in the middle of the night. The Walters loved the band so much that, when the Hummingbird closed, they built a huge addition off their house to host concerts for the band. They’d sit in the back of the room in two throne-sized chairs while everyone else sat on the floor. A drawing by a fan that was left in the passed hat while the band played. Over the next few years, the band beefed up their touring, getting booked not only in Denver and Boulder, but in places like Phoenix, Minnesota, and the Dakotas. They played bars, barn dances, church socials, festivals – including the second and third Telluride Bluegrass Festivals. They played everywhere and anywhere: Daniels recalls that they did a show at a local high school where they played for $75 and 100 pounds of beans – they literally played for beans. Luckey remembers it differently: they played for just the 100 pounds of beans, he says, and maybe some gas money. “But we needed the beans. We were seriously broke people.” Wherever they had to travel, they’d simply collect their entourage, pile into their school busses, and go wherever the music took them. Except, as it turned out, when the music took them to the offices of major record companies. Let’s just say that Luckey and Cahill, who were the spiritual leaders of the group, had a conflicted attitude toward success. It’s not that they didn’t want fame and fortune. They just didn’t want the compromises that came with it. The way they saw it, you couldn’t separate their music from their lifestyle, and they didn’t want big city ways encroaching on their free-wheeling values. Then there was the time that Capitol Records invited Magic Music to come to LA to sign a contract, but Luckey refused to go into their offices because someone at the door insisted he had to wear shoes. And the time the band went to Nashville and Larry Henley, who wrote “Wind Beneath Your Wings” for Bette Midler, offered them a terrific deal but, once again, Luckey refused to sign because he thought they were going to get ripped off. That decision was based on Henley’s shoes. Black is the new barefoot. Magic Music today, from left: Chris Daniels, Jimmy Haslip, Will Luckey, George Cahill, Tom Major, and TIm Goodman. Luckey is philosophical about his brushes with fame, content in the knowledge that raising a family on the Vineyard has made him a very happy man. “We had a problem building because of the way we looked at things,” he says. “We didn’t trust the capitalist system. We didn’t trust The Man.” As if doubling down on their leeriness of the mainstream, in 1974 they moved even farther up into the mountains, to the end of a twenty-mile-long dirt road. Their nearest neighbor was a Yaqui Indian. But this proved to be their last stop. 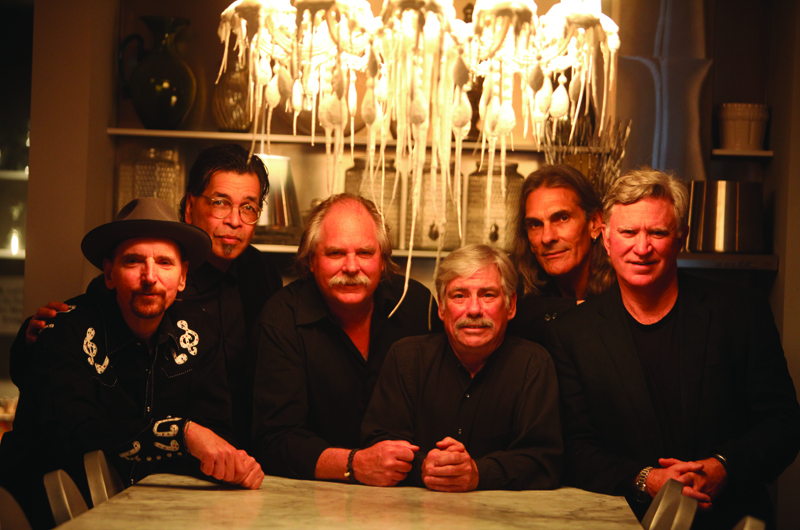 In 1976, after five years of playing and sharing the stage with bands like Cat Stevens, the Nitty Gritty Dirt Band, Todd Rundgren, and the Youngbloods, Magic Music broke up. There was one last inquiry from Flying Fish Records, which went on to become a division of Rounder Records, but by that time the music scene was either going toward disco or toward bands like the Ramones. Magic Music didn’t see themselves going in either direction. Perhaps not surprisingly, they didn’t respond. The Magic Music moment was apparently over, and everybody parted as friends. Luckey kicked around in rock bands for several years, then moved back to the Vineyard in 1980. He played in Alex Taylor’s band, Luckey Strikes, for five years and now teaches music on the Island. Cahill moved to Alabama, took up the blues harp, and eventually ended up touring the “Chitlin’ Circuit” with Alabama legend Mose Stovall and the Pharcyde Band. Daniels has enjoyed a long career in music and was recently inducted into the Colorado Music Hall of Fame alongside Judy Collins, while Makepeace spent many years sailing with his wife and now lives half the year in Mexico, where he plays on the beach with various bands. True to the original vibe of the band, the members of Magic Music stayed friends and kept in touch as the years and then the decades rolled by. So it was hard news to learn in 2010 that Daniels had leukemia. By then they had all lived through enough to know that life occasionally dealt hard cards. In 1991 Luckey fell off a ladder and smashed both his elbows, his left wrist, and all of his ribs. The doctors told him they could fix the wrist so it might work palm-up, as a guitar player might use it, or palm-down, as a keyboardist might, but most likely not both. “I didn’t think I would ever play guitar again,” he says. He chose to pursue a degree in music from Berklee College of Music, specializing in piano, which launched his career in teaching. The following year the group, this time including Cahill, played at a private party in Aquinnah. Not only did it still feel good, but with a little practice it sounded even better. Daniels, who is an icon in the Colorado music scene from his post–Magic Music career, suggested they do a gig in Denver at a theater called Swallow Hill. The show sold out in a week. The buzz was coming back, and along with it came the fans bearing gifts. After the concert, a fan from the old days offered the use of his recording studio in Boulder to the band. Always primarily a live show jam band – among the first crop of jam bands, in fact – Magic Music had never recorded much before. But the band spent a day in the studio and then Daniels stayed on to produce sixteen vocal and guitar tracks. These he sent to Goodman, for further work in his studio here on the Vineyard. Goodman has been best friends with the guys in Magic Music for most of his life, and has sat in with them on many occasions, but he was never actually a member of the group. Instead, he had his own highly successful career. His band, Southern Pacific, had four singles in the top ten of the country charts, and he’s played with the Doobie Brothers, Neil Young, Emmylou Harris, and others. These days, though, he has made it his personal mission to produce the album he felt Magic Music always deserved. The original songs have stood the test of time, but Magic Music’s long overdue debut album won’t be a museum piece. Working closely with the band members, Goodman has taken advantage of modern production techniques, and in some cases has freshened the arrangements so they sound contemporary. One of the first calls made was to Tom Major, a local drummer best known on the Vineyard for his work with the band Entrain. For nearly three years Luckey, Goodman, Major, and the others laid down tracks. The bass player, Makepeace, was unable to put much time into the project due to previous commitments, so Goodman called his old friend Jimmy Haslip to see if he might play on a few cuts. It was a reach, perhaps: Haslip has been nominated for some twenty Grammy awards, and has won two. After hearing the music, however, he didn’t just want to play on a few tracks. He wanted to be in the band. “I’ve never been able to get anyone to say no to this project,” says Goodman, referring to the string of heavyweights who signed up this past winter when he headed for LA to finish the album at the legendary EastWest Studios. Bill Payne from Little Feat is playing keyboards; Grammy Award–winner Sam Bush is on fiddle and mandolin; Scarlet Rivera from Bob Dylan’s Rolling Thunder Revue is also on fiddle; and Doobie Brother John McFee is on guitar. The Vineyard’s own Wes Nagy, an old bandmate of Luckey’s back when he was playing in Alex Taylor’s band, played piano on some tracks, and fifteen-year-old Darby Patterson of Edgartown, rocks some backup vocals. Amazing, nothing short of magic. The album is due to be released at the end of the year and after that, who knows? In an age when a kid can record an album on GarageBand over the weekend, it’s taken over forty years to produce this one. Some things are worth the wait. Awesome!! I started college at U of C Boulder the summer of 1971. I loved sitting out under the tall trees on campus listening to "Magic Music" play their beautiful acoustic music with intriguing harmonies. I'm a singer/ songwriter, too. They were an inspiration! So glad to hear news of them again. I met Will Luckey in the Luckey-Sayers Band. He and Tom Sayers named me McMike, which has stuck for almost 40 years. Who could forget Magic Music at the Stage Stop in Rollinsville the night the dance floor almost collapsed down into the bar? Love the whole story. I'm friends with Will and Tim. Played drums for a while with Tim Goodman, Bill Makepiece and an excellent guitar played named Tommy White. Those were fun days. had lunch with tim goodman in sausalito i think it was 1986, we shared a couple of great times when southern pacific was touring the west coast, have a great picture of him on the pier.my family and I met him at josey wales(country western tavern and dance hall in vallejo of all places) after their performance at the state fair. great to see his talent is still out there. he is a genius!! !